RacePak IQ3S street dash. The IQ3S is a complete dash cluster replacement, providing all standard road functions such as speedometer, tachometer, oil pressure, coolant temperature, fuel level, voltage & turn signals. Comes with a programmable shift light. 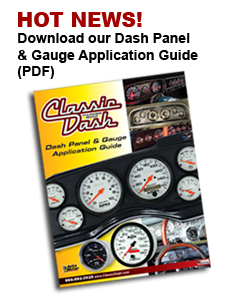 Ideal for all vehicles with modern engine swaps or aftermarket EFI systems. The IQ3SL Logger dash is virtually the exact same version of the IQ3S dash but also has the ability to store and replay 3 minutes of run time making it the perfect choice for the car that is used on the streets but also makes it's way to the dragstrip on occasion..
Molded ABS instrument panel for the 1967-68 Camaro. Fits RACEPAK IQ3 series digital dashes.